Synaptic assembly involves coordinated action of several interdependent events. These include: (1) formation of the electron-dense presynaptic site at the membrane opposite the post-synaptic cell, (2) clustering of the SVs, (3) establishment of the active zone with the proper ratio of docked SVs to presynaptic density, (4) localization of channels and regulatory proteins involved in neurotransmission, and (5) clustering of postsynaptic receptors. The localization of the major players in NMJ development is diagrammed in Figure 3.1A. A large part of synaptic development occurs via integrated retrograde and anterograde signaling at the synapse, as well as interconnected synaptic molecule recruitment. Early developmental events take place in muscle fibers that are not innervated, including the expression of CAMs. The Drosophila neurotransmitter, glutamate, and its receptor are also expressed in motor neurons prior to the arrival of the neuron at the synaptic site3. However, the development of the mature functional NMJ requires the presence of both the nerve and muscle. The molecular link between target recognition and assembly of synaptic components is largely unknown. Conceivably, proteins important for both target recognition and synaptic component recruitment may coordinate these two processes. For example, the guanine exchange factor, Trio, interacts with Dlar and may transduce LAR signaling to the synaptic cytoskeleton via Enabled39. C. elegans SAD-1 (Synapses of Amphids Defective) defines a novel conserved family of protein Ser/Thr kinases with the kinase domain closely related to that of PAR-1 (abnormal embryonic PARtitioning of cytoplasm) and the MARK (Microtubule Affinity Regulating Kinase) family. sad-1 (lf) mutants display mis-localized SNB::GFP in dendritic processes. Overexpression of SAD-1 can include clustering of SV markers or vesicle precursors at nonsynaptic regions. Thus, SAD-1 functions to couple neuronal polarity determination with SV clustering14,40. C. elegans SYD-1 is a novel presynaptic active zone protein containing PDZ, C2, and rhoGAP-like domains that also functions to regulate synapse assembly. Mutations in syd-1 cause mislocalization of synatic proteins and ectopically formed presynaptic terminals in dendritic compartments41 . The ectopic expression of synaptic components in syd-1 and sad-1 mutants suggests that they participate in linking target recognition with synaptic assembly. SV precursors are generated at the cell body and transported to the terminals along microtubules. The UNC-104/KIF1A kinesin is the major motor that transports SV precursors. In unc-104 mutant animals very few mature SVs are detected at synapses, whereas SV-like vesicles are retained in the cell bodies42. The conventional Kinesin-1 is a heterotetramer composed of two heavy chains and two light chains. The processive kinesin motor can walk continuously along a microtubule for several micrometers. Mutations in Kinesin-1 disrupt SV trafficking in flies and worms43,44. A conserved protein family, including Drosophila Sunday Driver, C. elegans UNC-16, and mammalian JIPs (c-Jun N-terminal kinase (JNK)-Interacting Protein) act as cargo adaptors for Kinesin-144,45. These proteins appear to affect SV trafficking by linking JNK scaffolding to the Kinesin-1 motor. Mutations in components of the retrograde motor, dynein, cause defective trafficking of the SV proteins, SNB, and synaptotagmin, but not other synaptic proteins46. In Drosophila liprin-a mutants, motor axons accumulate SV markers (Synaptotagmin and SNB::GFP) and clear-core vesicles47. Direct visualization of SNB::GFP transport in Dliprin-a mutants shows a decrease in anterograde processivity and an increase in retrograde transport initiation. 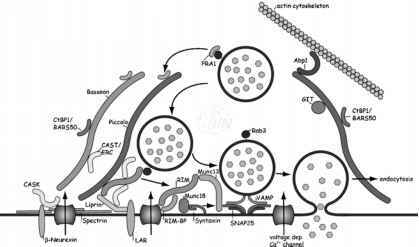 This study suggests a role for Liprin-a in promoting the delivery of synaptic material by an increase in Kinesin processivity and an indirect suppression of Dynein activation. In addition to transport, a major contributor to the SV pool is synaptic membrane recycling. Drosophila and C. elegans mutants defective in SV endocytosis such as unc-26/synaptojanin4S'49, unc-57/endophilin50'51, and unc-U/AP18052'53, often lead to a severe depletion of SVs at synapses. This shows endocytosis is a significant contributor to the SV pool. ERC (ELKs-Rab6-interacting protein-CAST)54,55 family protiens. syd-2 and Dliprin-a encode the worm and fly liprin-a, respectively, mutants of which display abnormal active zone morphology6,56. Thus, liprins are important organizers of the presynaptic density. Dlar mutants have abnormal active zone morphology similar to Dliprin-a56. Mutations in the C. elegans LAR isoform, ptp-3A, show synaptic pattern defects similar to, but weaker than, syd-2(lf)34. These studies are consistent with a role of LAR and Liprin-a acting together to pattern presynaptic assembly. The extracellular portion of LAR-like receptors can bind Nidogen-Laminin and Collagen XVIII57,58. Mutations in the C. elegans homologs nid-1 (nidogen) and cle-1 (collagen XVIII) cause distinct changes in synapse morphology59. Mutations in syd-2 are epistatic to mutations in nid-1 and ptp-3, but not cle-159. These analyses hint at the possibility that the presynaptic organizing activity of SYD-2 may be modulated through LAR-Nidogen, which, together with Laminin, secure the synaptic site. Formation and stabilization of the synapse often relies on large multidomain scaffolding/signaling molecules. Dap160, the Drosophila homolog of Intersectin, is such an adaptor protein, which localizes endocytic machinery60,61. dap160 mutant synapses have decreased levels of endocytic proteins, including Dynamin, Endophilin, Synaptojanin, and AP180, while other active zone and periactive zone markers remain unaltered. dap160 mutants display abundant, but small and severely deformed synaptic boutons. Dap160 is proposed to scaffold endocytic machinery and synaptic signaling systems to the periactive zone. The ~400 kDa multidomain C. elegans RPM-1 (Regular of Presynaptic Morphology) and Drosophila Highwire proteins (discussed further in Section 5.3.1.) could possibly scaffold synaptic machinery. However, this capacity has not yet been characterized. Clustering of neurotransmitter receptors is crucial for effective neurotransmission and is dependent on the presynaptic neuron. Drosophila postsynaptic glutamate receptor fields do not form unless induced by the presynaptic neuron62. In muscles with delayed or ectopic innervation, both receptor clustering and receptor synthesis are delayed or ectopic. Furthermore, mutations altering glutamate levels at the synapse alter the glutamate receptor field in Drosophila. Mutations in enzymes that affect levels of glutamate all affect the glutamate receptor field. For example, decreased glutamate levels increase glutamate receptor expression and clustering. The postsynaptic glutamate receptor fields, once formed, may be limited in size by nonvesicular glutamate release from the presynaptic terminal63. In contrast to Drosophila glutamate receptors, postsynaptic clustering of C. elegans GABA receptors requires the presynaptic neuron, but does not require GABA neurotransmission64. ACh receptor, acr-16f5. Notably, cam-1 mutants also exhibit defects in the presynaptic site, suggesting that retrograde signaling is important for presynaptic development or maintenance. In worms, LEV-10 is a transmembrane protein required in the body wall muscle for clustering ACh receptors66. lev-10 mutants display resistance to levamisole and have reduced density of levamisole-sensitive ACh receptors. The LEV-10 extracellular region is sufficient to rescue ACh receptor aggregation in lev-10 mutants, suggesting extracellular protein-protein interactions are involved in ACh receptor clustering. Drosophila Dlg stabilizes glutamate receptors within the clustered synaptic receptor field. Dlg, Fas II, and glutamate receptors are regulated by Drosophila PIX, a Rho-type guanine exchange factor67. Dpix mutations lead to decreased synaptic levels of Dlg, Fas II, and the glutamate receptor subunit GluRIIA and a complete reduction in the SSR. PIX and the Rho-type effector kinase (Pak) together regulate postsynaptic structure. It is poorly understood how the cell adhesion complexes, signaling pathways, muscle innervation, and neurotransmitter levels coordinate receptor expression and clustering.